A book about a notorious aircraft accident. 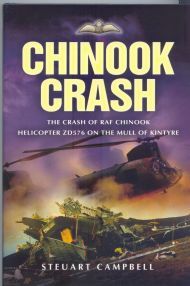 What caused an RAF Chinook helicopter to crash into the Mull of Kintyre in June 1994, killing all 29 people on board. This unique full analysis explains what the MOD have so far been unable to do, even refuses to do. On 2 June 1994, an RAF Chinook helicopter, with 29 people on board, crashed into the Mull of Kintyre in thick fog. All were killed. The twenty-five passengers were Northern Ireland intelligence experts on their way to a conference at Fort George. This remains the RAF’s worst peacetime accident. There is a full account of the events that that day and their aftermath, including all the subsequent inquiries, which eventually reached the House of Lords. Eastern Daily Press (9 Sep 2004) by James Goffin. Sunday Herald (19 Dec 2004) by George Rosie; 'an impressive piece of work'. The Scots Magazine (Mar 2005) by Chris Longmuir. 'an excellent analysis of the crash...intriguing'. Weather Vol. 60 No. 3 (Mar 2005) by Anthony Bowles. Journal of Meteorology Vol. 30 No. 298 (April 2005) by BP (Bill Pike?). The Log (Oct/Nov 2005) by Ron Ball. The Journal of the RAF Historical Society, No. 33 (2005) by Wg Cdr Colin Cummings. By Ned Middleton on the amazon.co.uk website (10 Jun 2006) 'a fine piece of work'. I did not take an interest in this accident until I saw a TV programme about it in 1998. I then realized that it lacked an explanation. Determined to see if I could find one, I began to examine the records of a Fatal Accident Inquiry held in Paisley in 1996 (I had not attended the Inquiry, although I knew someone who had). Looking through the volumes of transcripts, I realized that they must have been produced by shorthand writers (stenographers), who might have the whole transcript in a digital form. This turned out to be true and I bought the discs of the transcript from them (for £100)*. I was conscious then of being the only person in the whole world who had a copy of the records of this 18-day Inquiry. I had to make use of this to write a book, although at that time I did not have an explanation for the crash. Regardless, I started writing about the events that led up to the crash; they were all explained by RAF witnesses to the Inquiry. While doing this I acquired an agent, who encouraged me to continue and found me a publisher. Only near the end of writing the book, did I reach a conclusion about the cause of the accident, a navigation error that appears to be of no interest to the MoD. The latter's accusation against the pilots (that they broke safety rules) is justified but in no way explains the crash. Tim Slessor, in his book Lying in State (2004), does discuss the incident (inter alia), but blames the MoD rather then the pilots. *Later I donated the discs and a CD of my integrated and corrected copy of the Inquiry transcript to the National Library of Scotland, where anyone can inspect them. The families of the dead pilots, convinced that the latter could never have made any mistake, have always been convinced that there was a fault with the aircraft. They were supported in this belief by some members of the House of Lords, who called themselves the 'Mull of Kintyre Group'. Early on they were led by Lord Chalfont, but now they are led by Lord (Martin) O'Neill. On 7 December 2007, it was announced that the Secretary of State for Defence (then Des Browne) had agreed to meet Lord O’Neil to receive a new report that the Mull of Kintyre Group had compiled into the accident, and that he would consider its contents. This meeting took place on 15 January 2008 at the MoD. I was told that the report would be shown on a website, but I have not been successful in getting Lord O'Neill to publish this report. On 9 Dec 2008, the MoD announced that, because no new evidence had been presented, it would not be revising its decision. I continue to ask O'Neill for a copy of his report. On 4 Jan 2010, UK TV and radio news programmes announced the 'discovery' (allegedly by the BBC's 'Today' programme) of evidence that faulty engine control could have caused the accident and there were calls for re-examination of the matter by the RAF. The following day's newspapers carried the same report. On 7 Jan The Times carried a rebuttal of these claims by ACM Sir Stephen Dalton and The Scotsman carried one from me. On 11 Jan 2010, there were questions in the House of Commons to the Defence Minister asking if he would meet the families of the pilots. He agreed, but stated that, because there was no new evidence, the inquiry would not be reopened. There were other questions, one from an opposition MP declaring that a Conservative government would reopen the inquiry. After a change of government, on 26 May 2010 it was announced that there would be an independent inquiry apparently associated with the persistent idea that the pilots were wrongly accused of causing the accident (this seemed to prejudice the inquiry). This was reported in the Scotsman on 27 May 2010. On 28 Jul 2010, radio and TV news reported that retired judge Lord Philip would review the evidence and this was also reported in the following day's newspapers. It was also reported that his 'inquiry' would take place in private. On 16 Sep 2010, Dr Liam Fox, the Secretary of State for Defence, in a written statement to the House of Commons, confirmed Lord Philip's appointment, but added that he would be assisted by three Privy Counsellors: Malcolm Bruce MP, Lord Forsyth and Baronness Liddell. It was revelaed that The Mull of Kintyre Review was to be based at an office in Edinburgh, with Alex Passa as its Secretary. Those wishing to make representations to the Review were invited to contact Mr Passa, which I did, also lending him a copy of my book. I invited to talk to Lord Philip on 8 December 2010, when I explained how I thought the accident had occurred. On 12 Apr 2011, it was revealed that a 1992 RAF report expressed doubts about the reliability of the Mk1 Chinook. Some seized on this as more evidence that the pilots were not to blame for the accident, even though it happened to a Mk2. On 9 Jul 2011, the news media reported that Lord Philip's report (not to be published until the next week) would exonerate the pilots. This astonished me, as all the evidence pointed to their guilt. Liam Fox announced the result of the Review in the HoC on Wednesday 13 Jul 2011 and the review was published that day. He accepted a recommendation that the verdict of 'gross negligence' should be 'set aside' (i.e. quashed) and an apology be given to the families of the pilots. This was generally welcomed, but with unseemly jubilation by the families, who, together with the mass media, seemed to think that the pilots were being cleared of all responsibility for the crash (I've tried to correct that with various letters to the press). I think that Lord Philip (a retired judge) has inappropriately applied a legal nicety. It's obvious that the air marshals regarded flying into cloud without climbing as required by safety rules as 'gross negligence', a verdict that needed to be based on 'no doubt whatsoever'. I am sure that, on that matter they had no doubt. However, Lord Philip related it to the fact that no one knew the cause of the accident, another matter altogether. Thus he set aside the verdict on the wrong premise. Whatever the cause of the accident, which he thought would never be known, the pilots were still grossly negligent in ignoring flight safety rules. I am now calling for the new Service Inquiry to examine the evidence again, especially Boeing's 2002 report (not available to the original Inquiry) to try to establish the cause, which might well be pilot error (as my book explains, I think it was).